Depending on tee and hole location and wind direction. With the hole cut back left, and tees back, green contours favour a running draw. Tees and hole on the right side mean a soft high fade is required. Look to use the whole width of the tee to simplify access to the hole. As long as you are comfortable with it, it is legal to even stand 'outside' the area delineated by the markers as long as the ball remains within. Elevated tees accentuate the presence of wind, meaning this hole can be brute or a baby. There are clearly 3 options from the tee on this 'S' shaped hole with water left and right. The more one risks from the tee, the less water that needs to be carried on the approach and the more green is available to work with on the approach. Only the longest and most aggressive will try to drive the green. The 'middle risk' route is over the first left fairway bunker leaving a short approach wedge to the course's smallest green. Against the wind most will play to the wide right landing area leaving a short to medium iron played across the widest stretch of the lake. Know your game and know when to take a small risk. When playing too 'safe' to this green, erring long will mean water is still in play on the return chip! As the late BBC commentator Henry Longhurst liked to say, 'If you're going to play safe, make sure you're safe! Dramatic elevated tees literally sculpted out of the mountain leave a beautiful but intimidating view of the narrow ninth fairway. The keys to this hole are wind and the large tree obscuring much of the left side of the fairway. Extreme elevation will obviously exaggerate the wind's influence. Slightly hooked drives over the tend to get directed back into play by fairway contours, while drives erring right will be blocked out by trees and the rock face protecting the green entrance. Though it looks friendly, this green is one of the trickiest on the course with a false front and more slope from back to front than first appears. As with all good shorter two shot holes, precision play is more important than length. Excessive backspin may see the ball roll back off the false green front here. Risking a drive as close to the green as possible may mean a short enough 2nd shot pitch to reduce spin rate and keep the ball on the green. Though this is a very wide fairway, the ideal line is fraught with danger. The hole can be shortened in different ways when selecting the 'low' road. Take careful note of wind and yardage over the last of the left side fairway bunkers. Long hitters may be able to 'fly' these bunkers; short hitters who successfully skirt or draw the ball around them will catch extra roll from the down slope. For the less adventurous, stay on the 'high road', You must be prepared for a very long second shot from this right hand part of the fairway and may even have to lay up away from the water at the green's narrow entrance. The green has also been contoured to reward bold play. Approach shots played too safely short and right away from the lake will be left with fast chips and putts down towards the water! Look to where the water will drain to help you read putts, especially at the front right corner of the green. Contrasting with the previous hole, Players should stay on the high right hand side of the 2 level fairway to make the approach on this short par 4 easier. Only the top of flag will be visible from the lower left fairway and a nasty pot bunker will be more in play from this angle of approach to this very small plateau green. The steep false front on the green means strong players may need to beware of too much backspin on their approach. In this case, land past the green center or spin may draw your ball back off the false front on this small plateau green. Erring long will usually leave an easier up and down! Most players will benefit from using a running shot from the 'putting' hollows. Take a tip from the name! Use your putter (if not a fairway wood like a putter) from closely mown areas behind the green on this hole. Risk reward options are there for all to see from tee. Long hitters should take on as much of the marsh and bunkers as they dare to leave a long iron into this par 5 green. But beware the sucker bunker at end of fairway! 2nd shots also provide playing options. Staying right, whether short or over the long waste bunker, will offer the easiest approach angle to green. Know the realistic limits of your ability before selecting your 2nd shot route. So named because of the green setting among a crater rich in white dragon seams, this 'monster' par 4 is probably the most difficult hole on the course and the start of the 'home' stretch. The fairway is wider than it appears from the tee though there is very little playable rough. Stay left from the tee for easier an approach to green. Beware water short and right of the green. If playing safe, make sure of the yardage as fairway runs down towards water at lay up area. A safer play may be to go for green on your second shot, but err left. Correctly weighted shots landing slightly short will "collect" onto green. Though the hole can be set up many ways, depending on selected tee and hole locations, the bottom line is accuracy. Players who can shape the ball have an advantage with a 50 yard long green angled into the lake from left to right. Risk reward is again on offer. Only the brave (and foolish) will play for the back, right hole location. Others play safe to the front half of the green and take their chances of 2 putting. This Designer loves 'fear factor par 3's! This hole can be visually terrifying if you allow it to be! A soft, left to right shot is a great weapon here. Aim at the left side of the green, dial your clubface open just a degree or two open, trust your swing and swing confidently along your aim line. Que sera sera! Don't be intimidated. Fear has no place in your mind on this kind of hole. Accuracy is essential. Though barely over 300 yards only heroes and zeros will risk driver on this hole. Play your best long iron or straightest wood club to the left side of the turn point and then a short iron up to an elevated green. The 15th plays deceptively uphill, so take one more club on both tee and approach shots. 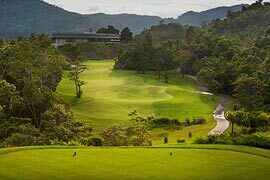 At the 16th tee kiosk, you are sitting at by far the highest point on a Phuket Golf Course, more than 330 feet above the 14th green, so breathe deeply before selecting your strategy on this devilish short but stunningly pretty par 4! Regulation play is possible using virtually any club in the bag from the tee, so consider your club selection very carefully. Long hitters will comfortably be able to drive the green, but double figures are also easily within your reach! Find the fairway from the tee. Don't get sucked into a left side pin position. Missing the green right may be a far better option. On very tight par 4 holes, you may find it useful to imagine you are playing a par 3. In this case the green (landing area) is one of the biggest you would ever play! The green centre is nearly 150 feet below the Pro tee. Wind felt at the tee may not affect your shot as expected down below! Take 2 clubs less than normal and swing easy to keep the ball flight lower. The green is huge, but you must find the right part of the green to avoid 3 putts. Though long on the scorecard, accuracy is again the key as almost all straight drivers will reach 300 yards and more. Your stance on this 'roller coaster' fairway will dictate your second shot strategy. Water waits on the right, the Canyon on the left and numerous bunkers for slightly misplaced shots. Don't just blaze away on your second shot. Manage your game! Decide which target landing area gives you the best chance of success, check your yardage carefully and choose the club that will get the job done. Remember; shots tend to be sliced from downhill lies. Select a more lofted club than normal to counter the effects of the slope, aim a fraction left playing the ball a little closer to the 'high' foot and allow your body balance to go with the slope at address to make the lie 'flat'. Finally, don't try to help the ball into the air with you swing; you already selected a more lofted club to take care of that! Setting the tone for the entire round, risk reward options are presented from the outset. Only very confident drivers will take on the narrow, blind landing area. A lost ball is almost certain for failure to hit the fairway. On the first shot of the day, the best strategy may be to play to the wide, visible landing area and have faith in your accuracy from a flat lie with a mid-iron to the green. Don't let the cliffs left of the green influence your approach as a deep swale will catch shots even slightly short and right. A short par 5 a very wide fairway is rarely seen on modern courses, but this tee shot provides a welcome opportunity for golfers to 'open up' with the driver early in the round. Drives played up the more dangerous left side create better visibility and easier playing angles for the second and approach shots. The elevated green is perhaps the most severe on the course and strong players must beware of too much spin on approach. On very wide fairways like this it's easy to get careless with alignment. Pick a definite spot on the fairway to focus your aim. The unique green setting, created by years of storm water run off through sandy tailings, is another but different reminder of the mining history of the site. Short is dead, so accurate club selection is vital. Best percentage strategy may be to err long and right if you can trust your short to get up and down from the putting hollow behind. To further reward precise short iron play, the green is divided into three distinct sections. Putt from one to another will be difficult with the largest section at front right creating very fast putting situations for those who have played 'safe' long. Closely mown swales behind the green present numerous short game options. Novice players should take the putter wherever possible. Although long, this down hill, double dog leg pay 5 can be reached in two by the longer hitters. The perfect drive is left to right favouring the right, while the second shot must be played low and right to left from a down sloping fairway to take advantage of ground contours on the approach. This is a hole that truly rewards shotmakers. Green contours are very gentle, but beware the waste bunkers flanking both sides of the second landing area. If you are not confident on sloping lies, try to avoid them; play clubs that see you hit to the flatter areas of the fairway. Hole location and your length will dictate your strategy here. Most strong hitters will lay back from the tee short of the left side sand bunker and the right side grass bunker. A precision iron shot is then called for to hit the correct section of this undulating green. Shorter hitters should consider hole location and the predominant shape of their shots. This green can be approached from either side of the fairway around the two central pot bunkers. Generally speaking, those staying left, close to the lake edge will have easier approach and putting options. All should watch out for the unique 'sinkhole' separating high and low approach routes! On the course's longest par 4, long hitters are encouraged to really let loose off the tee. The 6th, one of the course's widest fairways, is divided by a central fairway bunker and flanked by a steep fall off and waste bunkers the entire length of the right side. Depending on tees used and player's trajectory, shorter hitters have to decide to play to the high or the (more dangerous) low road. Trees, bunkering and contours at the Green entrance are designed to reward approach shots from the right. Miss the green left for an easier up and down. When playing from waste bunkers, remember that you are allowed to ground your club, and take practice swings. Try practicing long fairway bunker shots with a lofted wood played with a slightly open face. This will create bounce and more margins for contact error allowing even slightly miss hit shots to gain reasonable distance. But don't forget to allow for a slice!